It’s been quite a while since I’ve messed with my design, but I finally got inspired to make some changes. I turned the main page into a table of my best content. For lists of things, like Projects, Reading, and Tutorials, I turned those into tables as well. 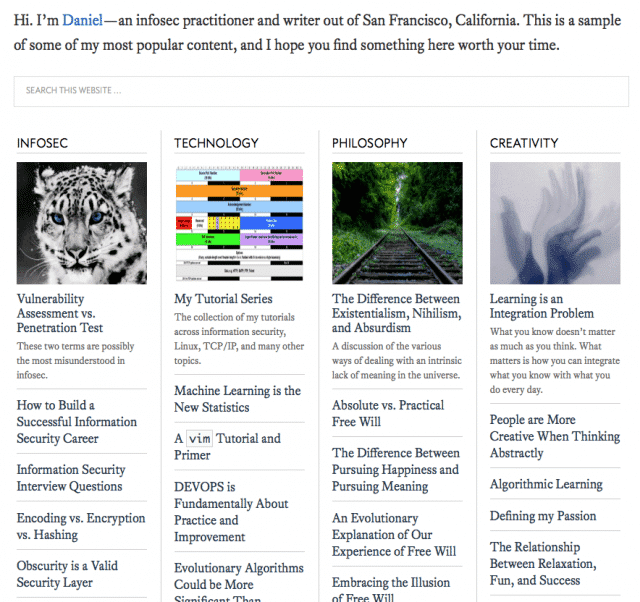 I tightened up the Blog layout, showing more posts and smaller thumbnails. I’ve been cleaning up the sidebar for a couple of months now. Essentially I tried to make things easier to find, and more pleasant to look at. Been on a typography kick again lately. Anyway, it feels like a decent upgrade going into 2017, and if you have any thoughts on the design—love it or hate it—do let me know.